When I started wargaming back in the early 90s, independent wargames stores were pretty common here in the UK. Games Workshop opened their store in Maidstone in 1992 on Pudding Lane, and I’m pretty sure they chose that location because it was just around the corner from Maidstone Games, an indie store that had been there since forever, selling D&D books and BattleTech mechs and the like. Nowadays, probably thanks to Games Workshop’s aggressive growth strategy (plus the general trend towards “clone town” retail districts), it seems like indie stores are pretty rare. Maidstone Games closed in the late 90s and since then, Maidstone has only had GW, and those few shops that did stock wargames miniatures and hobby supplies tended just to install a GW retail rack and be done with it (a notable exception being Hobbycraft, who also stock Flames of War and GF9 hobby materials). 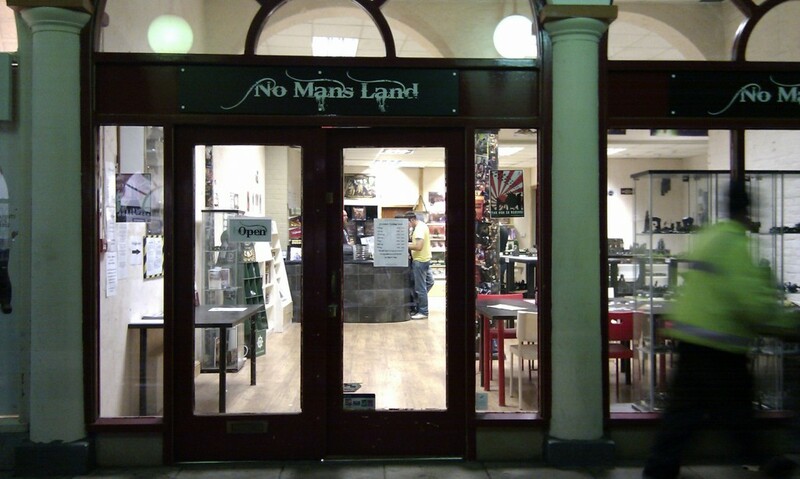 As a result, it’s pretty hard to find a FLGS in the UK nowawadays, so the opening of No Man’s Land, a new — and more importantly, really cool — independent store in your home town is a pretty big deal, in fact it’s big enough to warrant a celebrity appearance at its opening. Having discovered its existence, I wasted little time in dropping in and taking a look. So far, it’s like a dream come true. The shop is large (much larger than I was expecting) and spacious, and filled with the awesome sound of hard rock and heavy metal (which for me is the only proper soundtrack to wargames). There are half a dozen chest-high wargaming tables that can be rented for £2 per hour – if you sign up for an annual membership (£20) you can pre-book them, otherwise it’s pay and play. There’s also a nice big area for painting and hobby stuff, and a nook (still under construction) for playing RPGs. 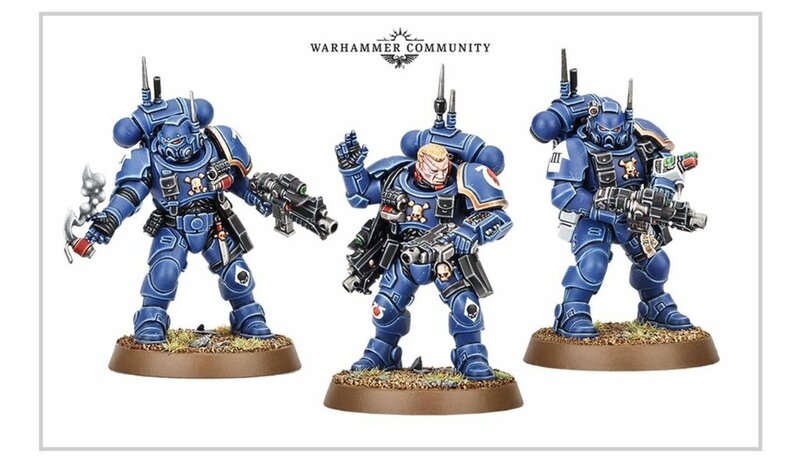 They currently stock GW a-plenty (and at lower prices than you get direct), plus Flames of War, Mantic Games, Firestorm Armada, Distopian Wars, Talisman and many others. Classic BattleTech stuff is arriving soon. Best bit of all – they play Epic! I’m so stoked that No Man’s Land exists that I’ve made it my personal mission to support them with my hobby purchases. From now on, I’m going to buy everything through them, and only buy online or direct if they can’t buy it in. 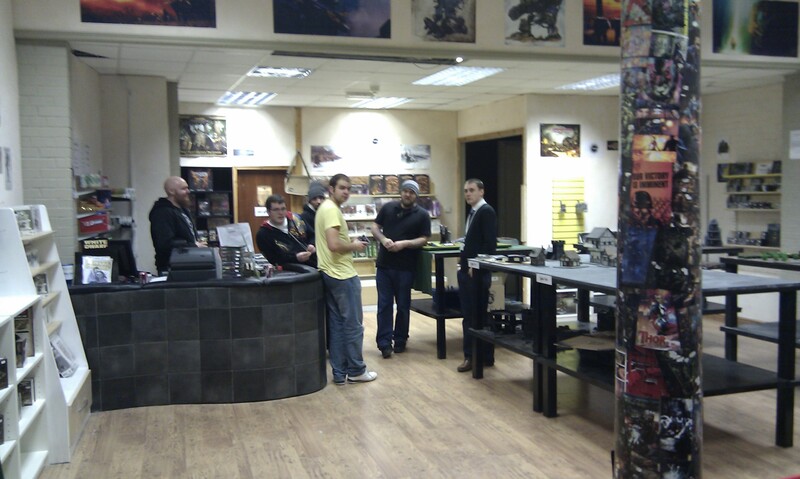 And I’m going to be dragging my mates down for games of 40K, Epic, and BattleTech. Support your FLGS! If you don’t, then you can’t complain if it closes down. I currently help Justin at No Mans Land in Maidstone and am present in the shop most days (can’t miss me I’m the only person with a tie on) and I am looking for people to request various games they would like available in the store.  Additionally at the start of Feb 2012 I am starting a Blood Bowl tournament and league and will welcome all players to join. We currently have three board being made. Thank you for your comments and the support of everyone. Hope to see you in store again. 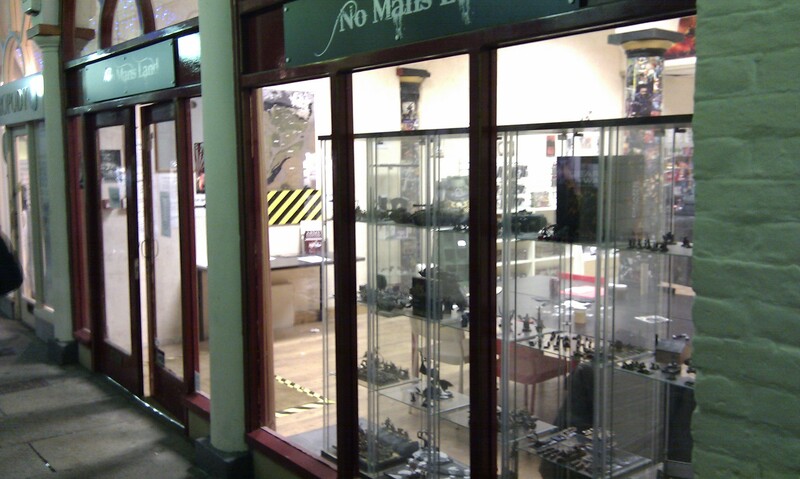 I’m after somewhere to play some WHFB, and this store would be ideal. Don’t know onyone who plays locally so a club evening would be ideal. Hi Luke – I know that a lot of the regulars play WHFB, and they have quite a bit of terrain, so I am sure you’d be very welcome! Ever considered stocking ‘Bolt Action’ Miniatures from Warlord Games, And holding games at the shop? I’m pretty sure that No Mans Land does stock Warlord miniatures and games. If you want a game, just show up and someone will probably want to have a game with you! You can also ask on the forum. I was in the store today, and there was plenty of Bolt Action going on, and several club members are working on building armies. Looks like a pretty cool game. My sone is 13 years old and plays war hammer 40k, chaos space marines r his thing, just wondering if you have any clubs running that would be suitable for him or if you know of any in the local area? Your son would definitely be welcome at No Mans Land. There is also the Maidstone Wargames Society which meets in Loose village hall, although I don’t know how popular Warhammer 40k is with them. I know that Darren (who helps out at NML) has been planning on doing kid’s sessions on sundays. He is fully CRB checked and qualified to look after children without adult supervision (despite his fearsome appearance! ).